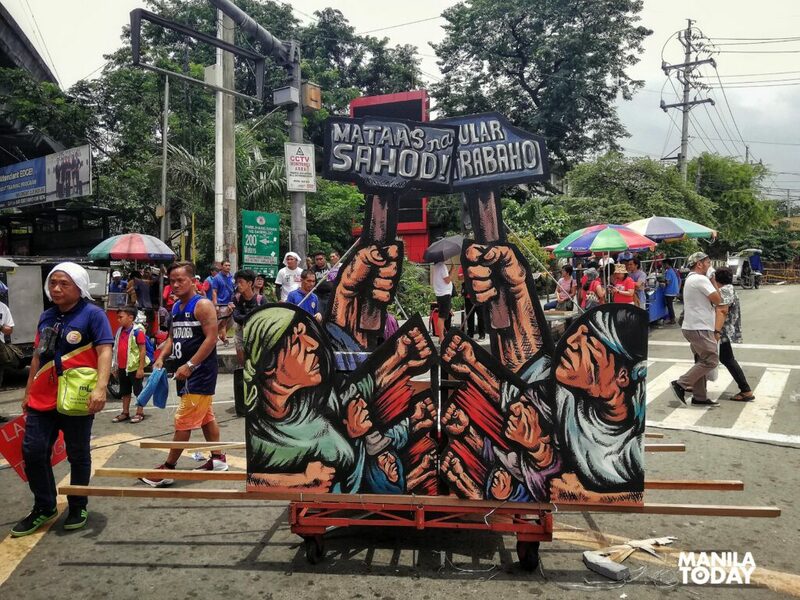 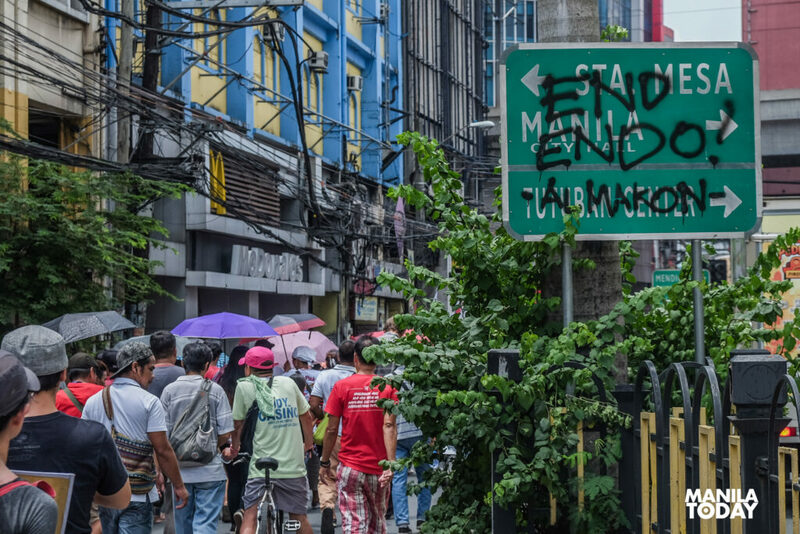 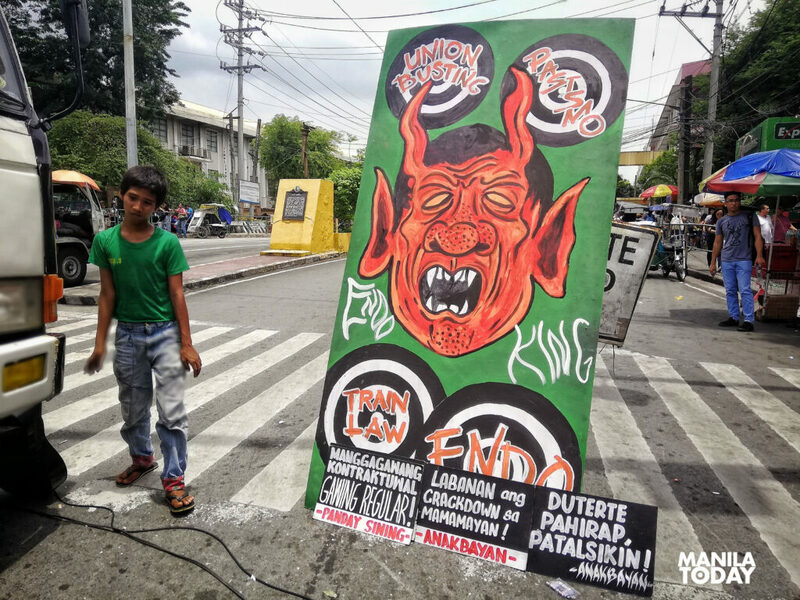 Naming Filipino workers as ‘modern-day heroes’, thousands of workers coming from various labor groups under the Kilusang Mayo Uno (KMU) – Nagkaisa labor coalition as well as church groups held a ‘Martsa ng Manggagawa’ from Welcome Rotonda to Mendiola in Manila today. 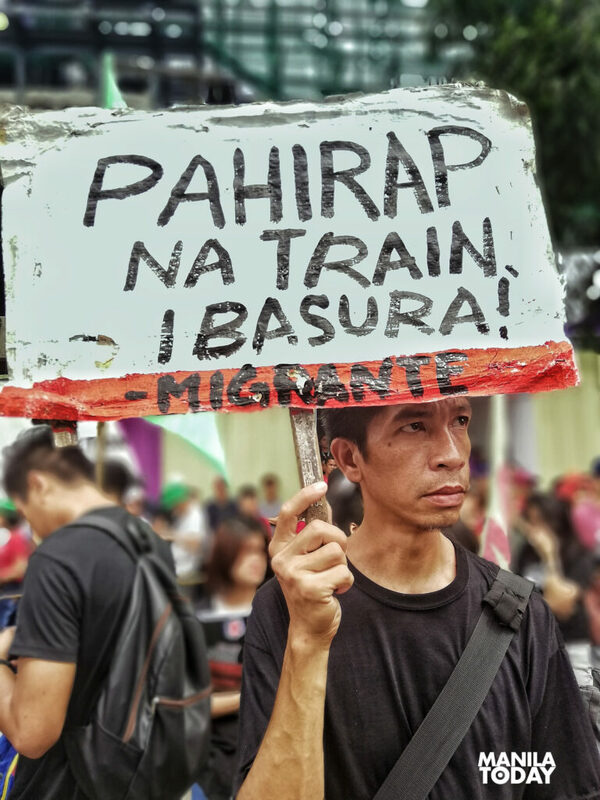 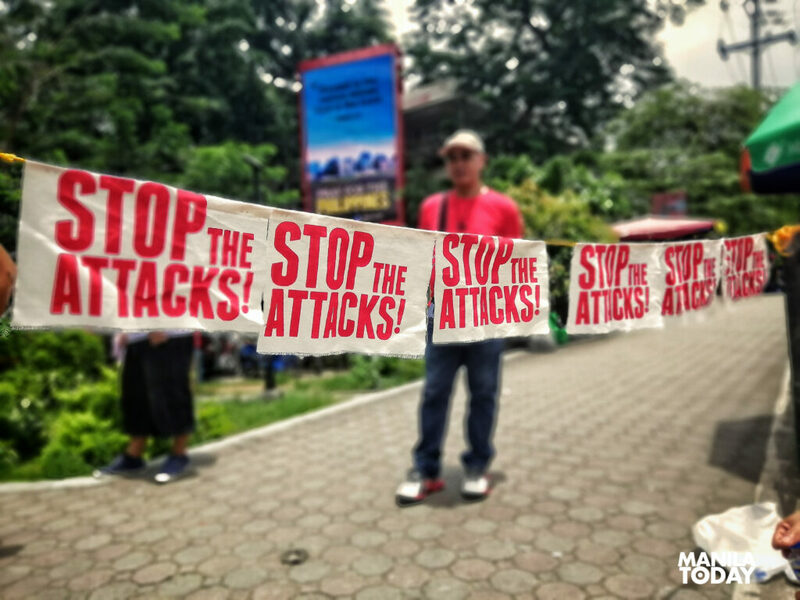 Protesters bore calls condeming the Duterte government’s ‘attacks’ on wages, jobs and rights of Filipino workers. 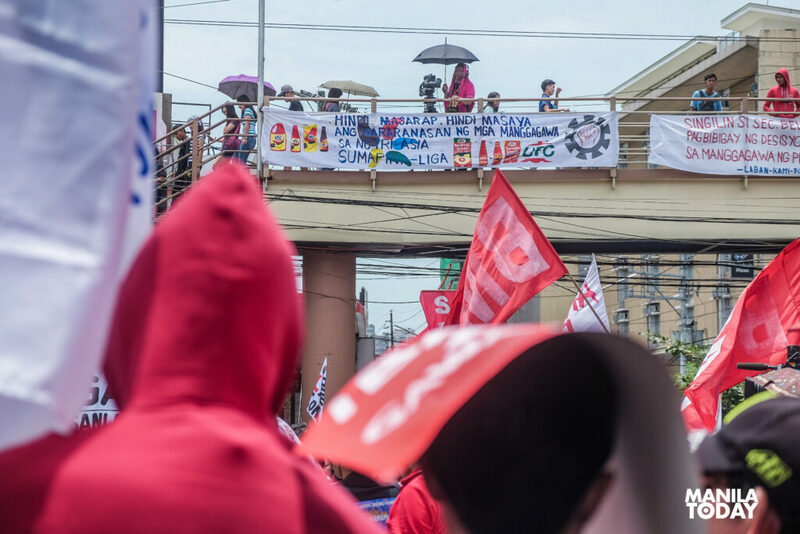 They also raised the labor sector’s demands for a national minimum wage, end to contractualization and respect for trade union and human rights. 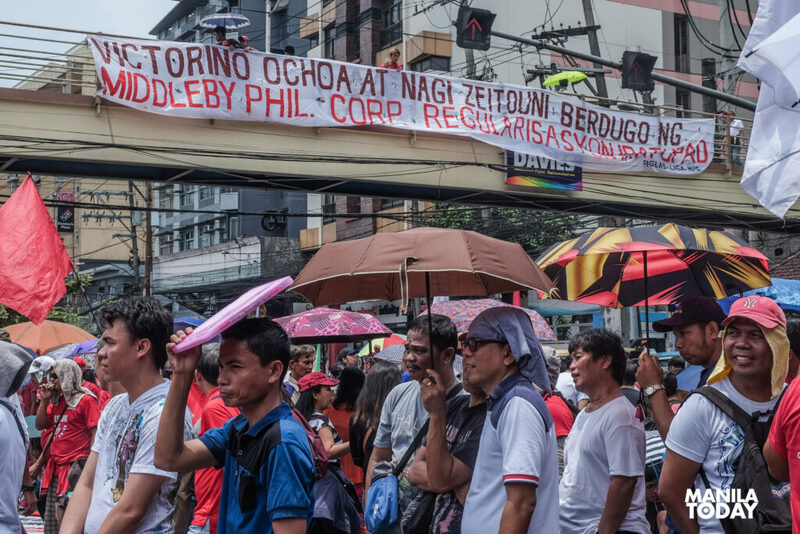 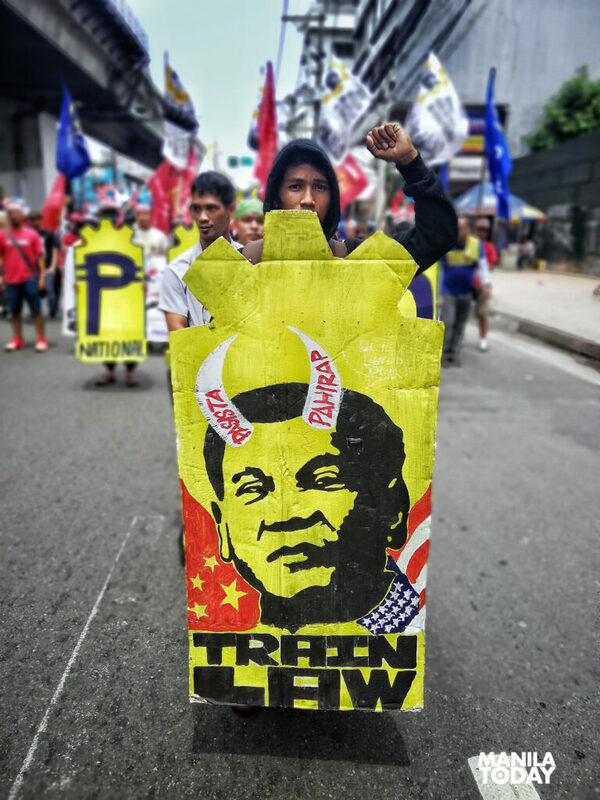 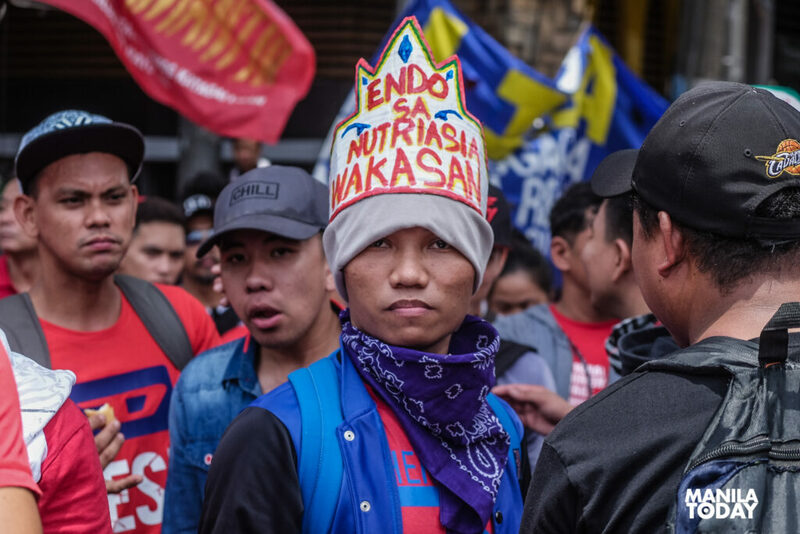 Some of the labor unions and workers associations who marched during the protest rally in Mendiola were terminated contractual workers of Philippine Long Distance Telephone Company (PLDT), Nutri Asia, Jollibee Foods Corporation, Middleby, and UniPak sardines, among others. 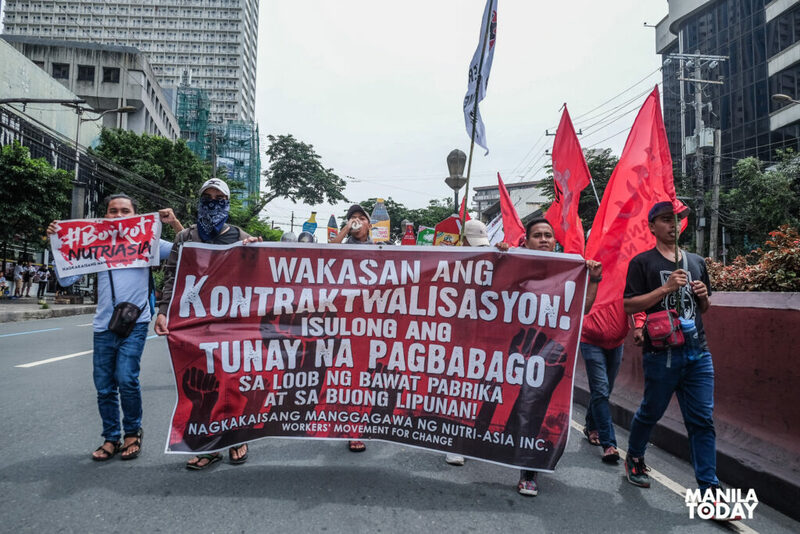 Terminated workers slammed the Duterte government’s failed promise of ending contractualization. 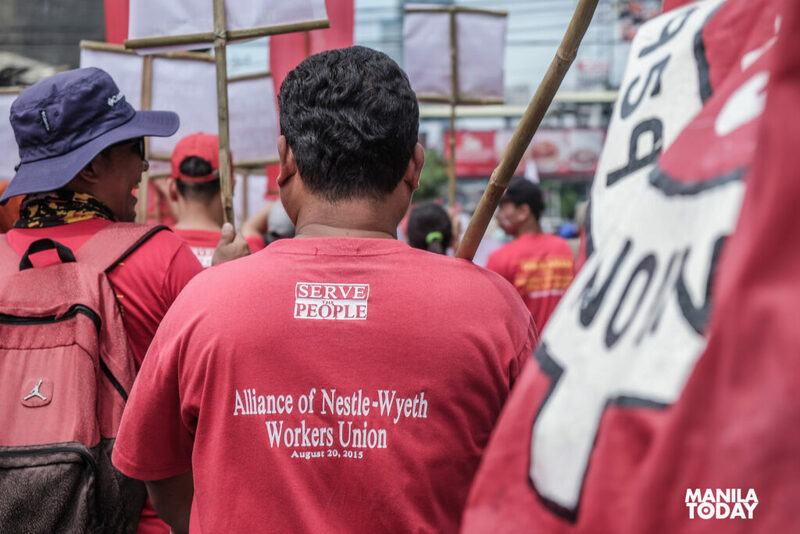 According to them, instead of being regularized, workers who fought to become regular employees were terminated. 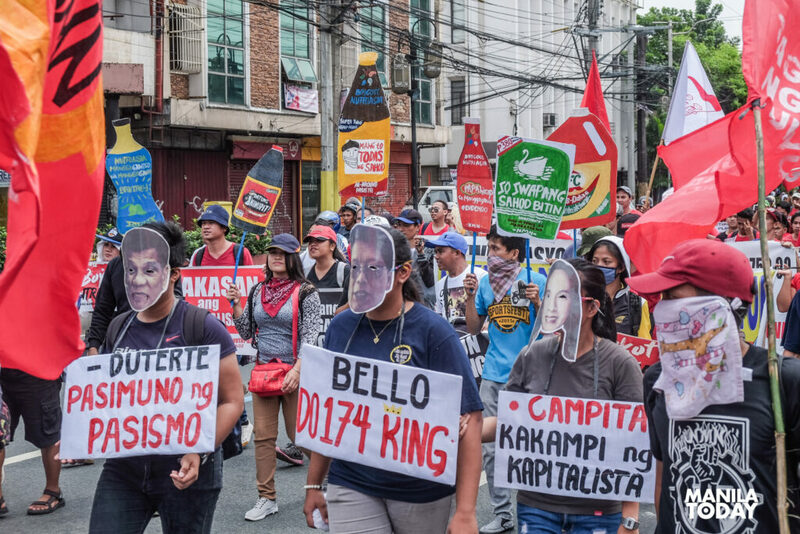 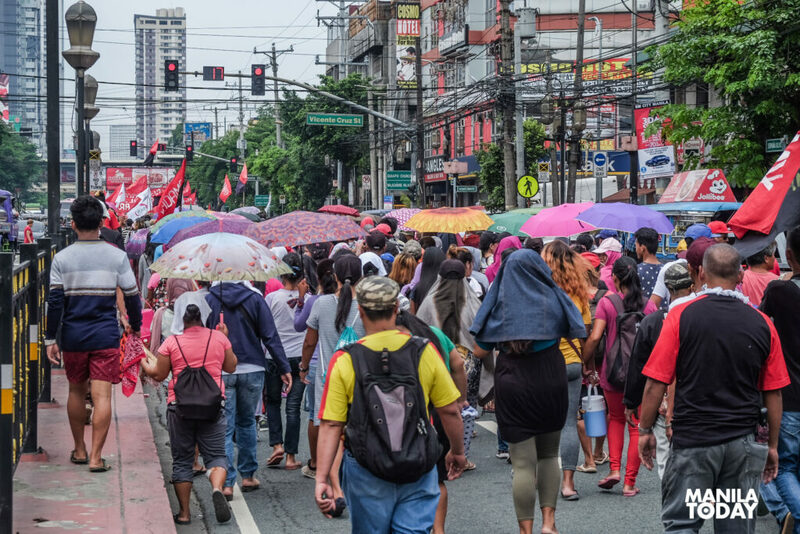 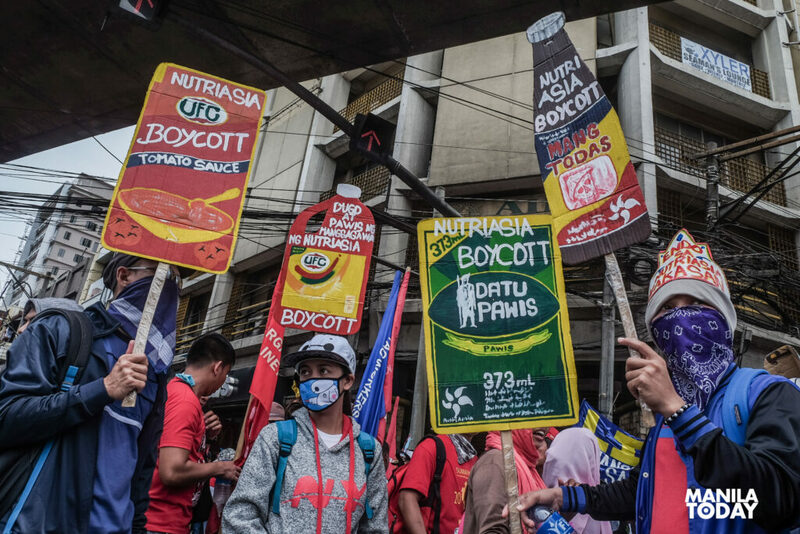 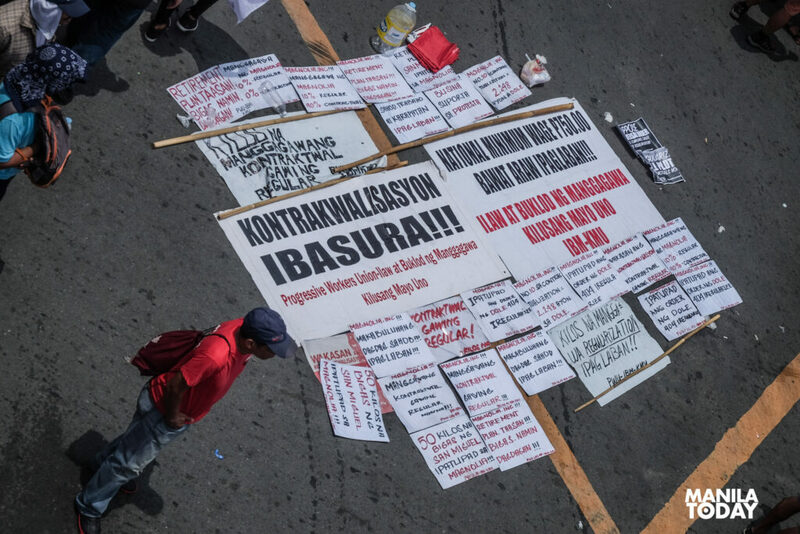 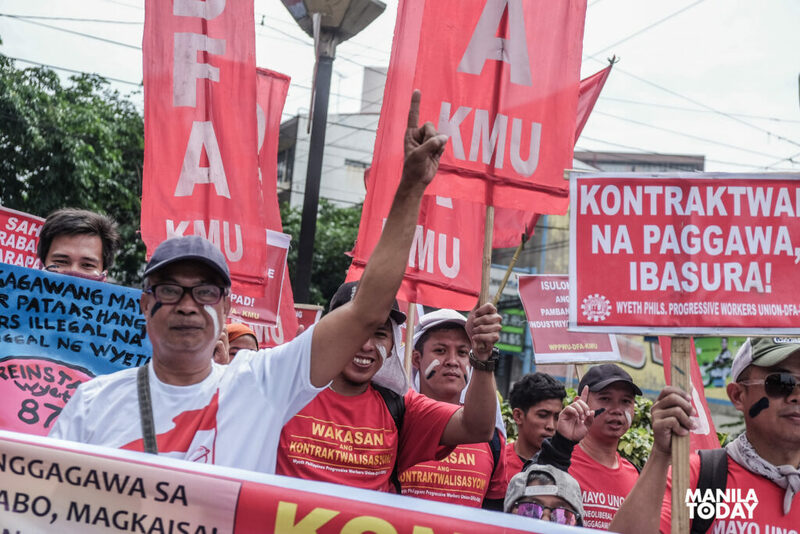 KMU cited that the government’s Labor Department Order 174 and Executive Order 51 led to mass retrenchment in big companies and that its so-called solutions to contractualization remain ineffective and destructive for workers. 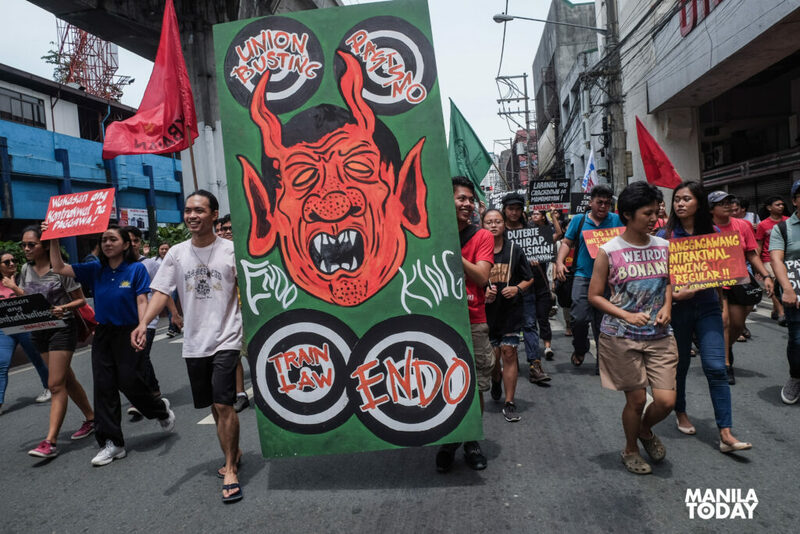 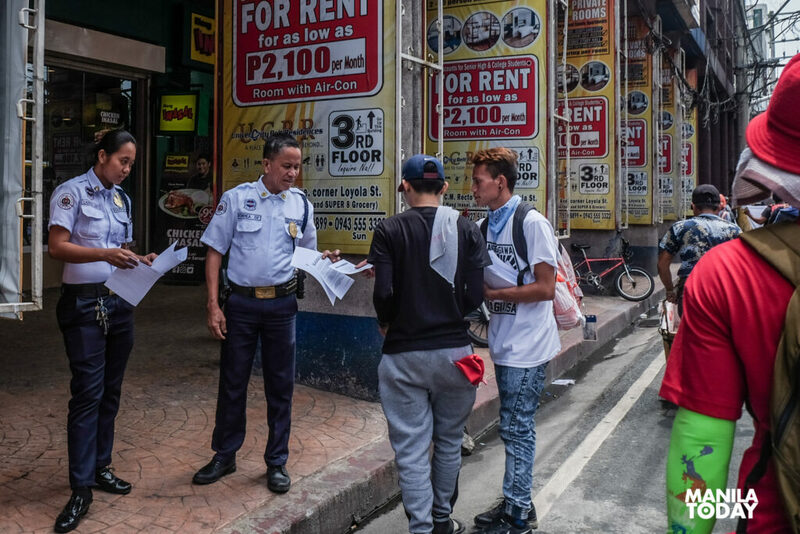 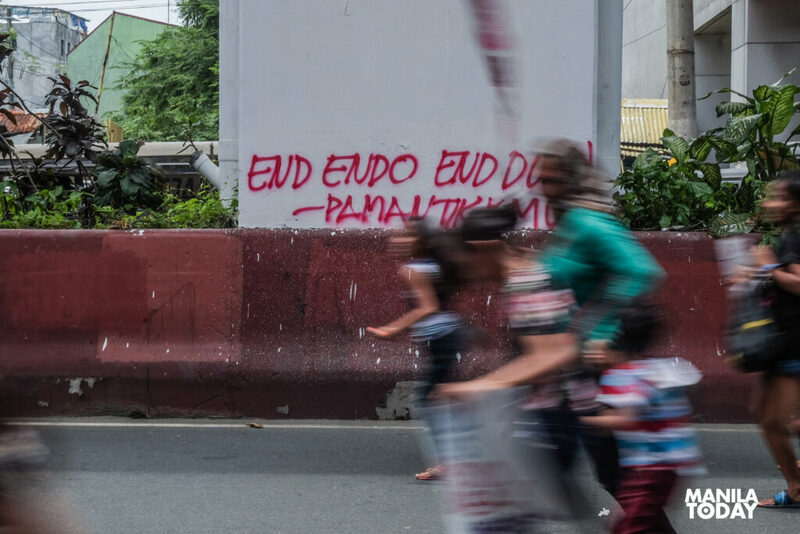 According to them, while these these ‘ineffective’ measures are being implemented, Duterte shields capitalist interests by continuously allowing subcontracting. 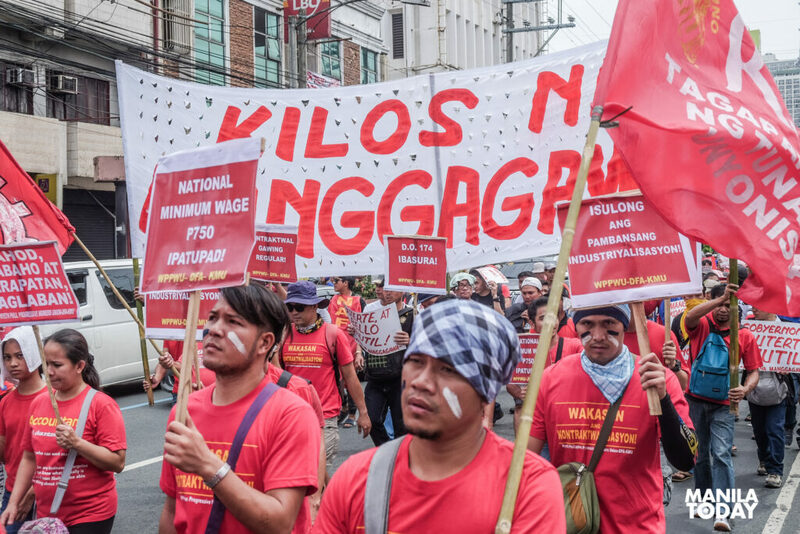 “Filipino workers are our everyday heroes, laboring with their sweat, blood and tears to earn for their families and produce wealth for our nation,” said KMU national chairperson Elmer Labog. 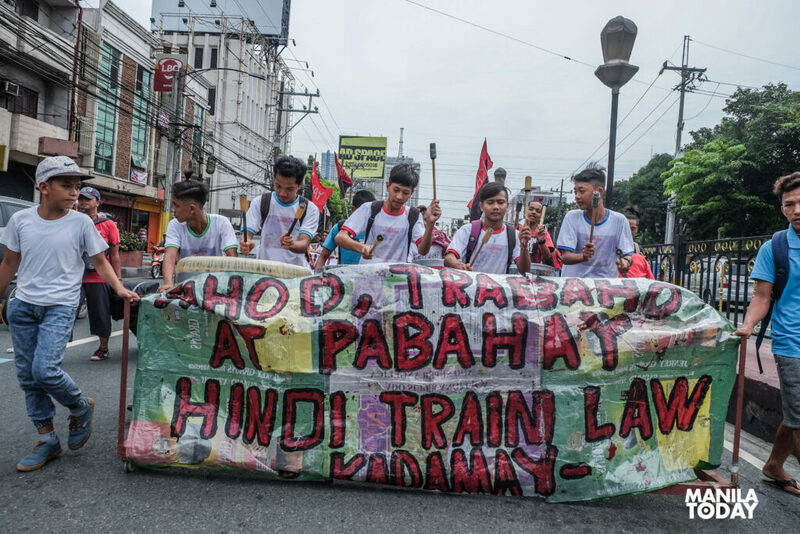 Labog also exclaimed that the Tax Reform for Acceleration and Inclusion (TRAIN) Law aggravates the long-drawn issues of Filipino workers on the real meager value of wage, unabated price hikes and the most recent crisis of record-high inflation rates. 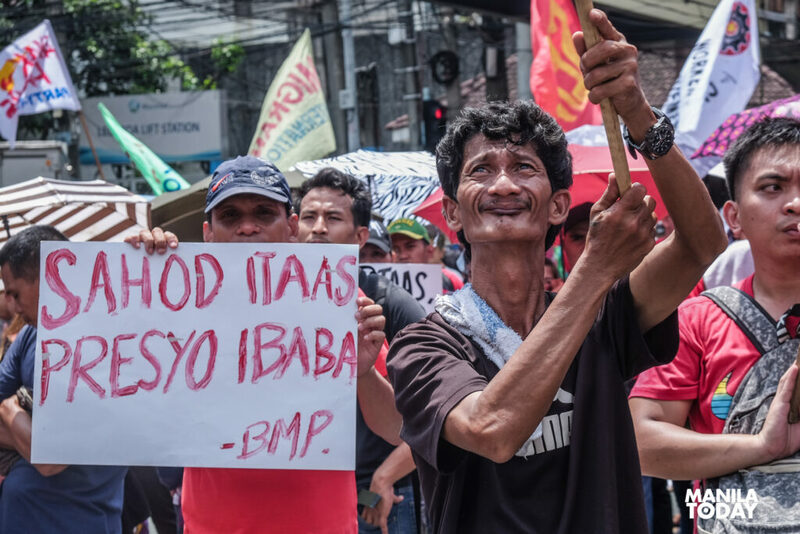 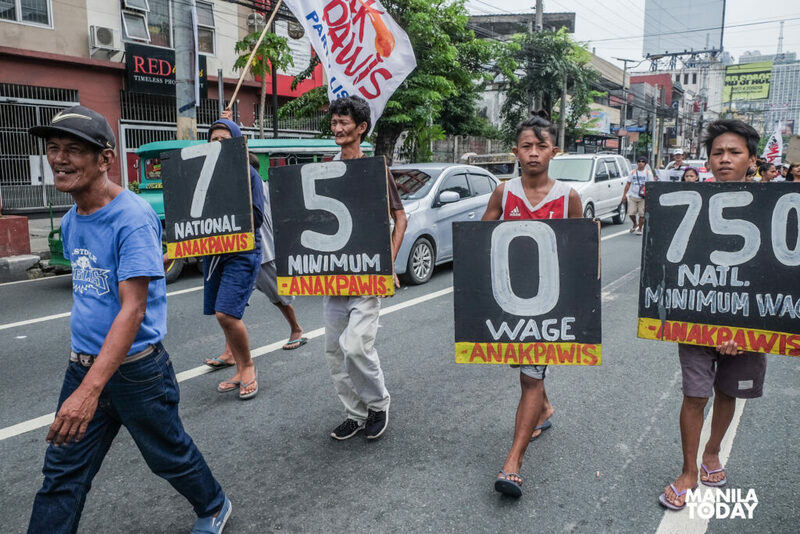 “Amid rising prices of basic commodities, the least that the government can do is to heed the workers’ demand for a national minimum wage of Php 750 a day and abolish the regional board setting that has been dragging down workers’ wages to poverty levels,” Labog said. 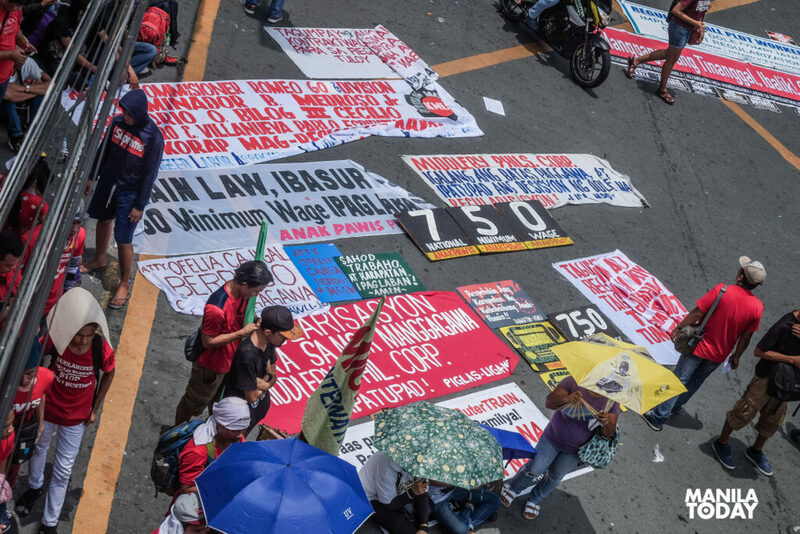 Protesters also protested the political violence being inflicted on workers. 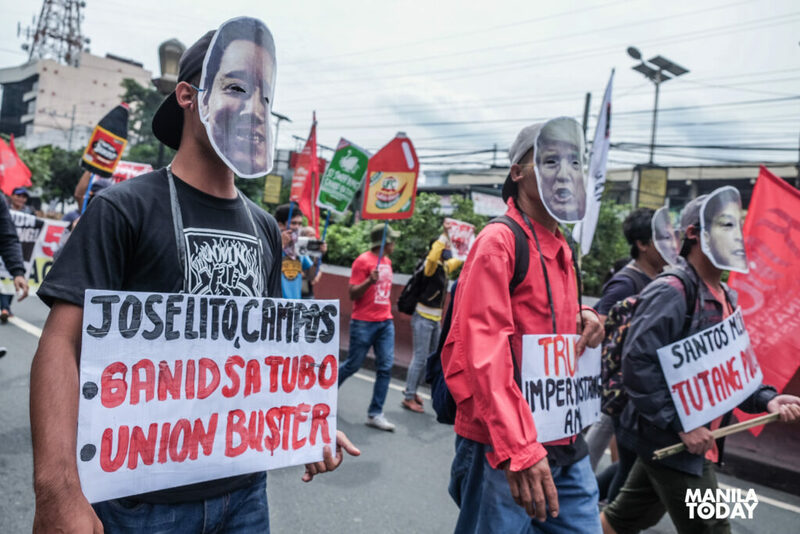 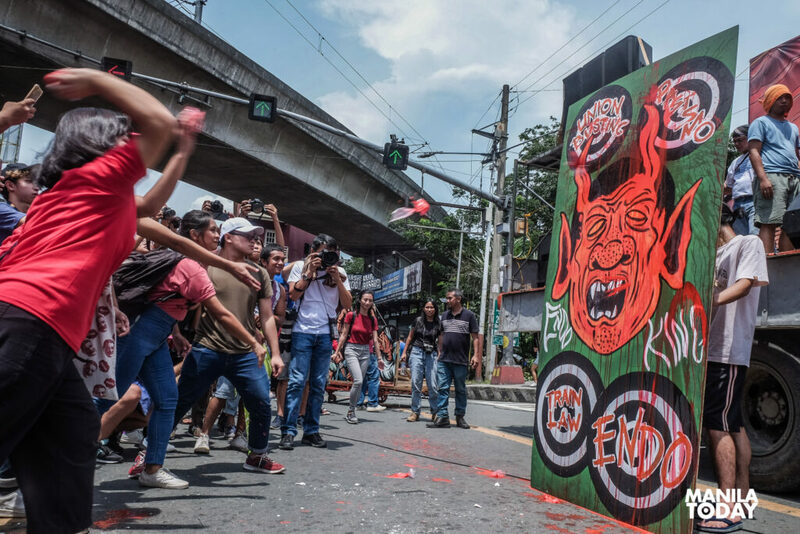 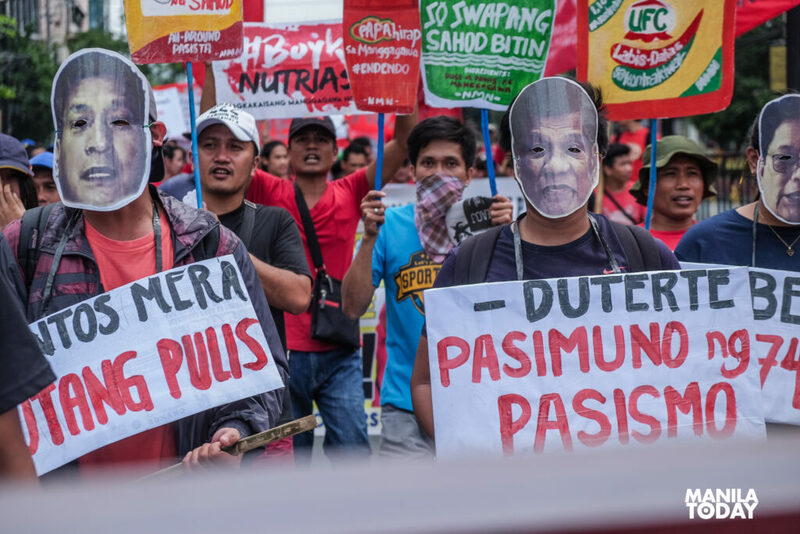 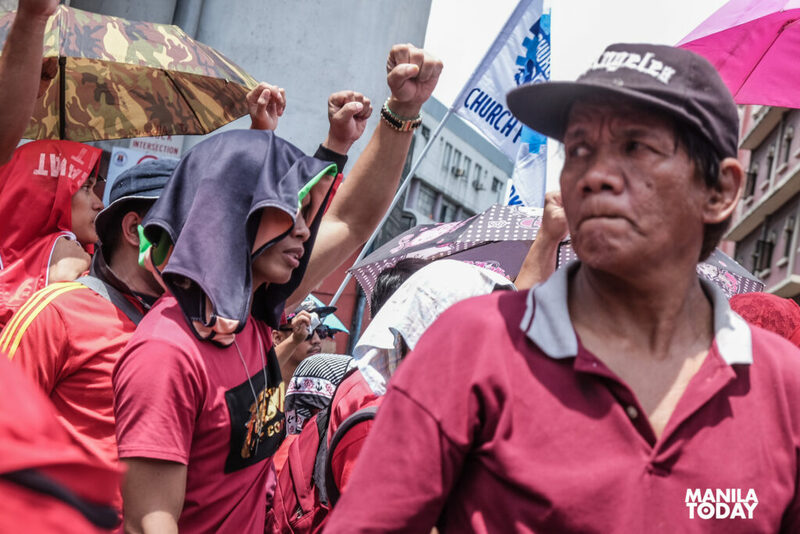 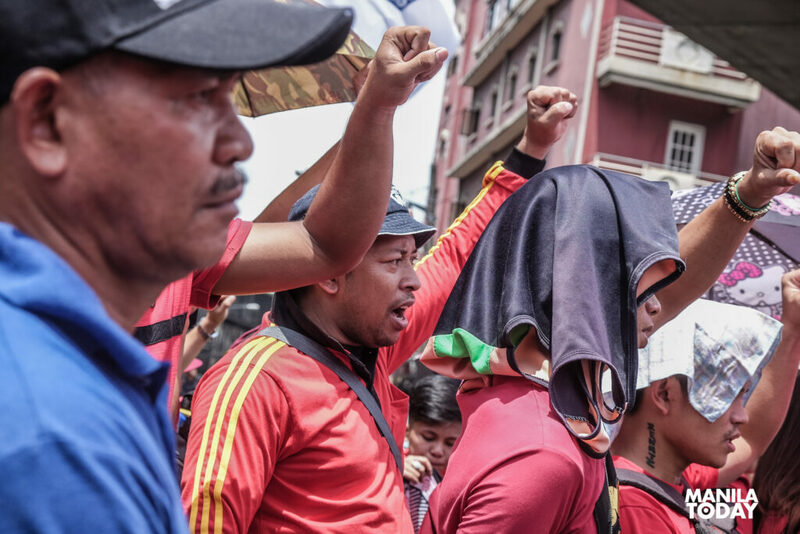 Labor leaders cried foul over Duterte’s deranged crackdown against his dissenters that has resulted in the murder of over 30 unionists and labor activists, illegal arrests and filing of fabricated charges, terrorist-tagging and harassment of unionists. 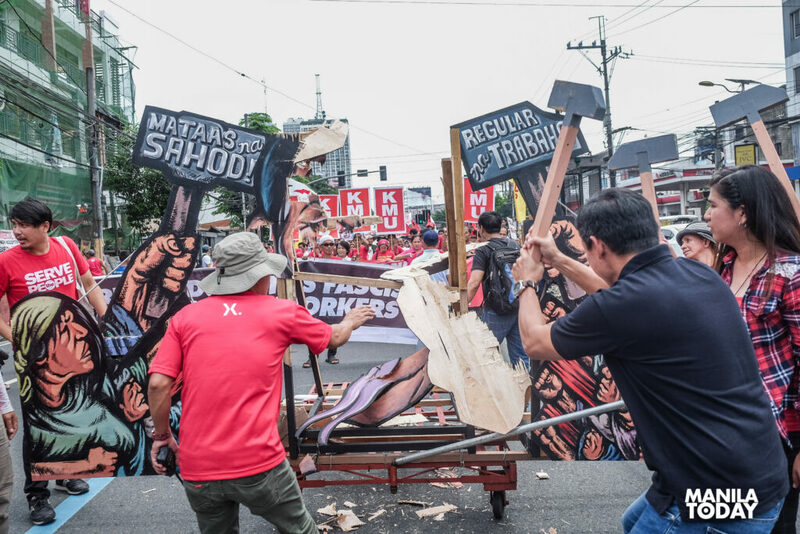 Labog noted Duterte’s tirades against KMU and the right of workers to build unions. 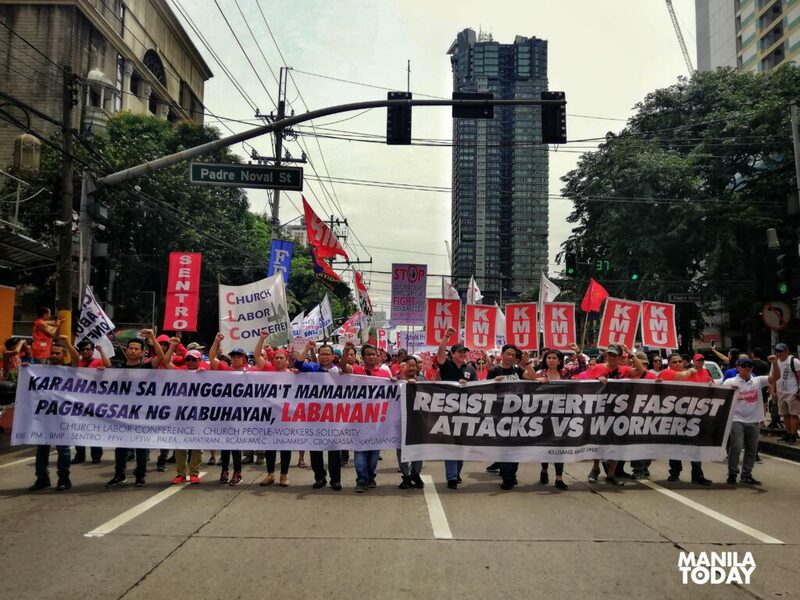 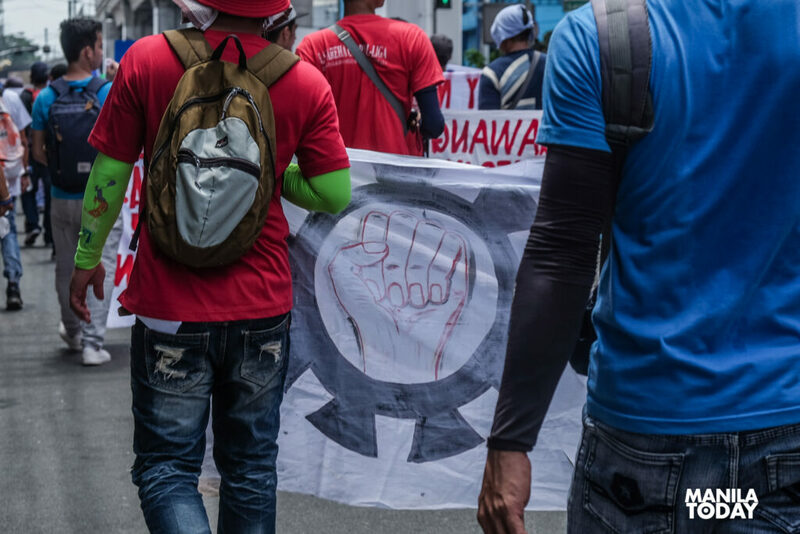 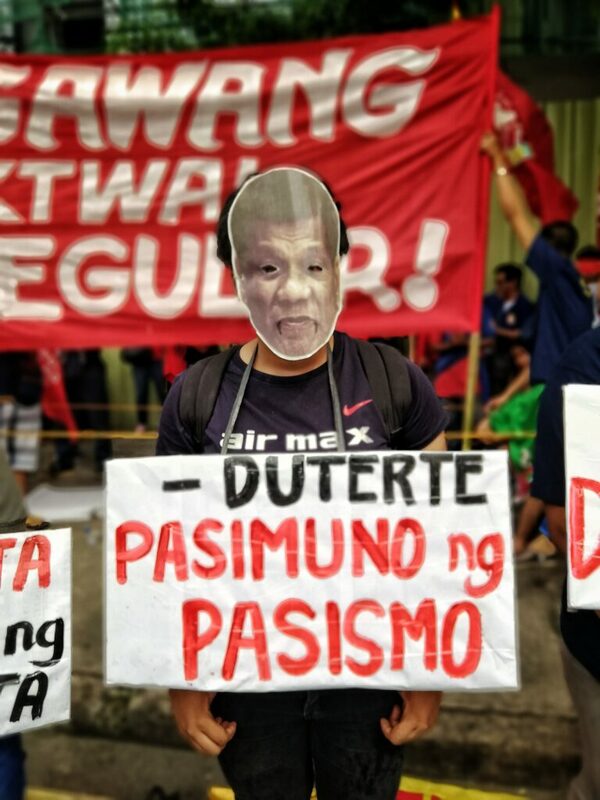 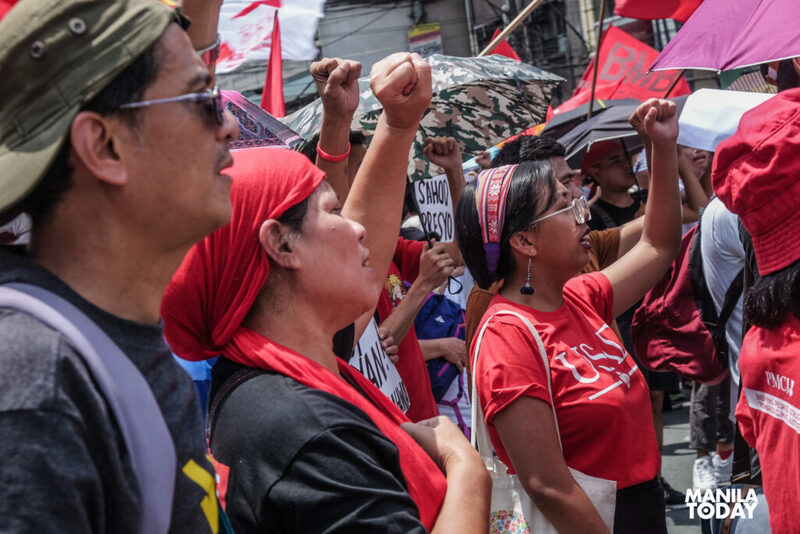 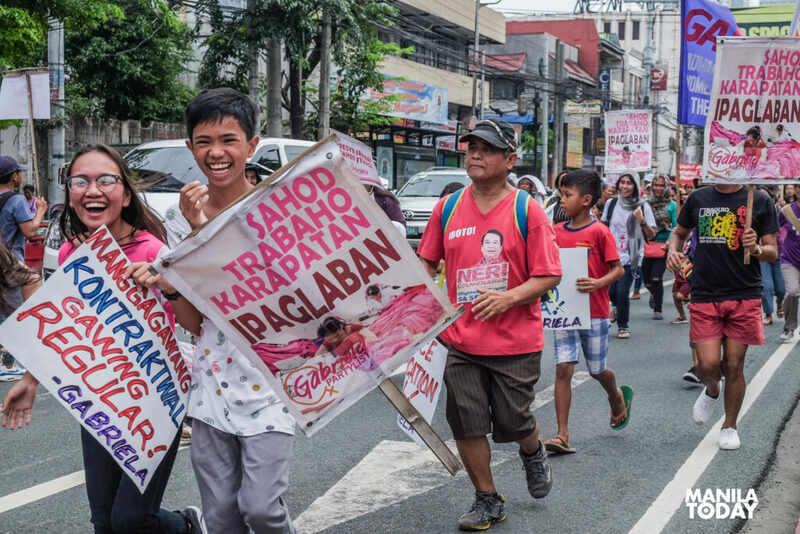 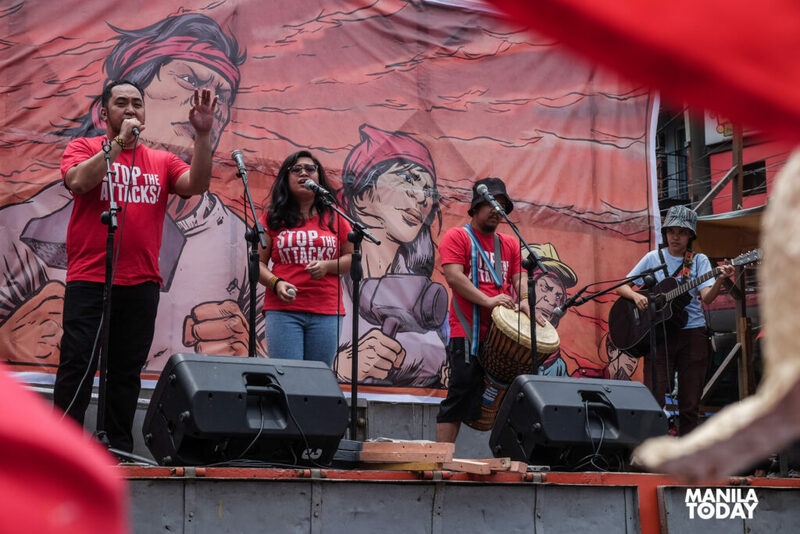 “Duterte is clearly trying to discredit our legitimate organization, our just struggles and demands for regular jobs and living wages to justify his fascist dictatorship’s brutal attacks against labor and human rights,” he said.